Faithful Thinkers- Defending God's Existence and Compatibility of Science with God and the Bible: Book Review: Who Was Adam? 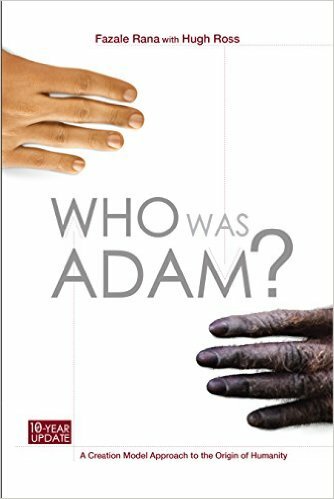 Book Review: Who Was Adam? Ten years ago Dr. Hugh Ross and Dr. Fazale Rana of Reasons to Believe released their book "Who Was Adam?" that presented a scientific model the posited that Adam and Eve in the book of Genesis were the original pair of humans. They examined the latest discoveries and put forth predictions for the scientific community to evaluate. That book was one of my first apologetics books I read that convinced me of the historical accuracy of the Genesis account of origins. A decade later the authors have released a second edition (softcover, Kindle, promo video) that updates the reader on the latest discoveries regarding the origins of humanity. This is one that I have been anticipating for at least two years; let's see if it lives up to it. With this edition, Ross and Rana chose to keep the original edition intact in the first two parts of the book then evaluate the model in the third part. This review will provide a chapter-by-chapter summary of the book's contents to give the reader an idea of what to expect, but this review in no way should take the place of reading the book itself. I will conclude the book with my thoughts and recommendation. Part 1: What Is Man? Drs. Ross and Rana begin by explaining the differences between the two commonly accepted accounts of human origins: King David's and Charles Darwin's. They explain that the biblical view (King David's) is that humanity is a special creation of God, one created independently of all other creatures. Humans possess the Image of their Creator, which no other created creature possesses. According to this view, humanity is not only different from the animals in degree but in kind. By contrast, the Darwinian view holds that humanity descended from primitive ape-like ancestors. Each generation mutated to become closer and closer to the humans of today. There is no essential difference between animals and humans; humans are just another animal. Since the writing of Darwin's The Descent of Man, several discoveries of fossils that appear to fall into a morphological line between ancient hominids and modern humans have been discovered. The scientific community, the media, and the public have embraced these fossils as providing solid evidence of the truth of human evolution and the falsification of the biblical view. However, Drs. Ross and Rana believe that when the evidence is examined in more detail, the opposite conclusion is more reasonable. The second chapter is designed to provide the reader with a brief overview of the current fossil finds that evolutionists believe are related to modern humans in some way. Drs. Ross and Rana explain the different specimens, their current place in the human evolutionary tree (according to the evolutionary paradigm), and the genetic and morphological features of those specimens that give scientists the ideas of where they fit in the tree. The authors discuss the infamous Piltdown Man forgery and the fact that Neanderthals have now been regarded as a side branch, among other controversial findings. Dr. Ross and Rana take the time to make the distinction between homo sapiens and homo sapien sapiens. The former includes hominids, while the latter excludes them, leaving only modern humans. The authors also make clear that they reject referring to any of the hominids prior to the appearance of homo sapien sapiens as modern humans (God's Image bearers); only homo sapien sapiens belong in that category. Drs. Ross and Rana prepare to present their model by explaining the source of their model. They begin with the Bible. They take all passages that speak about humanity and humanity's origin and using the historical-grammatical method on all passages, they arrive at a (and sometimes a list of several) consistent interpretation for the passages to develop a complete picture. This complete picture is then presented in the scientific language of testable predictions. They recognize that in some cases several consistent interpretations of passages are possible, so it gives a bit of flexibility and robustness to the model which allow for debate and fine-tuning of the model via scientific methods. They emphasize that predictions are not the same as prophecies, rather they are logical outworkings of the model. Humanity traces back to one woman (Eve) and one man (Noah). Humanity's early population size was relatively small. Humanity originated in a single location in or near the Middle East. Humanity's origin dates between 10,000 and 100,000 years ago. The origin of the female lineage (Eve) predates the origin of the male lineage (Noah). God created humanity at the "just-right" time in Earth's history. Human culture appears and expands explosively in the archeological record since humanity's origin. Humans share anatomical, physical, biochemical, and genetic similarities with the extinct hominids as well as with the great apes and other animals. Humans are behaviorally distinct (in ways that reflect God's image) from the earlier hominids, the great apes, and other animals. Human life spans (once longer than 900 years) became progressively shorter after the flood. Humanity spread around the world from in or near the Middle East relatively recently. They explain that testing predictions do not necessarily need to wait on future discoveries; they can begin with the already-known facts of human origins. Putting the model to the test via its scientific predictions is the goal of the rest of the book. To begin the investigation into the genetic evidence that supports the Reasons to Believe (RTB) creation model, Dr. Ross and Rana give the reader a quick explanation of DNA, mutation rates, and molecular clocks. They explain that several studies have revealed that humanity origin took place in a single location and from a small population. Direct evidence has been found in mitochondrial DNA, Y-chromosomal DNA, nuclear genes, pseudogenes, endogenous retroviruses, microsatelite DNA, minisatellite DNA, and SINE DNA. While indirect evidence has been discovered through investigation into the origin of tapeworms, malaria, ulcers, and body lice. All these lines of evidence agree with the biblical model of human origins. Rana and Ross explain that these studies have compelled scientists to change their views of human origins from a multiregional view to one more in line with the biblical model. Interestingly enough, this new model has been called the "Out of Africa model" or "the Garden of Eden hypothesis." However, while evolutionary scientists do accept the data of these studies, they are reluctant to accept that they reveal humanity's actual origin. The difference between the "Out of Africa model" and the biblical model offered by Ross and Rana (the Reasons to Believe creation model, a.k.a. "RTB Model") is that naturalistic models of population expansion do not allow for populations of fewer than six hundred members to survive. This is due to the accumulation of harmful mutations over time. The RTB model does not suffer from this problem because the first humans were created with DNA that is free from harmful mutations, and the bottleneck on the human species was not far enough away from humanity's origin to acquire enough negative mutations to prevent the population growth from a much smaller beginning population. Ross and Rana then move to the archeological and anthropological evidence. They begin by identifying several characteristics of the Image of God that, according to their model, is a feature exclusively of modern humans (homo sapien sapiens). They deny that any other homo species contains the Image of God; thus, they predict that the archeological record will reflect this difference. The capacity for art, music, technological innovation, advanced culture, ritualistic behavior, and awareness of an afterlife are the primary features that are the focus here. Ross and Rana take the reader through several discoveries and research projects that cover cave art, jewelry, musical instruments, advanced tools, burial sites, and clothing. They note that the cave art analyses demonstrate no gradual increase in complexity, rather it just appears. The same goes for jewelry, musical instruments, and clothing use. These all appear in the archeological record simultaneous to the dates indicated by genetic evidence (see the previous chapter) for the appearance of modern humans. Neither do any of these appear at sites of prior homo species. Jewelry and musical instruments also do not have any immediate survival advantage, so that would indicate that the time spent to manufacture them (as opposed to tools for hunting) was for categorically different purposes not exhibited in other homo species. Burial sites that coincide in dates with modern humans have markedly different characteristics, including organized burial of multiple bodies and presence of jewelry and other artifacts commonly associated with thoughts of an afterlife and protection of the body. None of the burial sites that date to the time of the other homo species possess these characteristics. Tools have been found in both modern human and other sites. However, the tools in the human sites bear a much greater precision and complexity of manufacturing which is not found in tools associated with other homo species. Also, the source of the material for the tools often are thousands of miles away rather than the immediate environment. This indicates an extensively sustained and more purposeful intention for the finished product than merely a quick fix to an immediate survival challenge (such as eating). This "explosion" in advancement is often called "anthropology's big bang." Since the archeological and anthropological evidence points powerfully towards the behavioral distinction between earlier homo species and homo sapien sapiens (modern humans) and the sudden appearance of the distinction, it appears that the evidence supports the claim of the Reasons to Believe model, that there is a difference between the two that is not just degree but kind, brought on by God's special creation of modern humans in His Image. The advanced and categorically distinct behavior of modern humans, though, is not the only scientific evidence that human origins is the work of a Creator. The disciplines of astrophysics and geophysics reveal several time windows that must coincide for human life and modern, technological societies to exist. Dr. Ross and Rana explain how several features of the galaxy and the planet place lower and upper bounds on when would be the best time for humanity to arrive on the scene. They cover the Milky Way's spiral structure stability, epochs of supernova frequency, ice ages, the sun's luminosity stability, the earth's rotation rate, earth's tectonic activity, earth's natural resource abundance, and earth's climatic stability. Each of these features (and many more) would destroy advanced life (and some, all life) if life existed on either side of a specific time window. All these time windows overlap enough to make human life possible. And the fact that that combined, smaller time window takes place at the same time that the genetic, archeological, and anthropological evidence has shown is when humanity arrived on the scene, indicates purposeful design- exactly what is predicted by the model proposed by Ross and Rana. But the model does not stop at the purpose of the Designer being mere compatibility of physical conditions for human life, but that those humans might discover creation beyond their immediate environment (and recognize that it is the work of the Creator). Another feature that was not mentioned in the list above is that humans were created (and still exist) in the perfect time window for the maximum number of perfect solar eclipses. If this time window was not met, then foundational discoveries to the launching of the disciplines of astronomy, mathematics, and physics could never have taken place. The time windows mentioned above powerfully point to a Creator for humanity (mere deism), but the fact that this Creator included another time window for the discovery of the immensity of the creation and, by extension, the Creator, Himself, points to a personal Creator (theism). This is a more specific prediction of the Reasons to Believe model that the discovery of this time-window confirms, as opposed to more deistic models. Since the Reasons to Believe model is based on the claims in the Bible about human origins, it takes the claims to long life spans to be historically accurate. This provides an intresting challenge to the model. Dr. Ross and Rana must provide mechanisms that would be present in the first humans that would extend their life spans to those compatible with the records in the Bible, then they need to provide mechanisms that would limit life spans to those we see today and take place at the time that is recorded in the Bible. They explain several studies that have shown that lifespans can be altered by reactive oxygen species, caloric intake, heat shock proteins, telomere length, and radiation exposure. Each of these mechanisms seem to be independent of one another and may be combinable. So, with the proper biochemical conditions, the lifespans recorded in the Bible are possible. Of course, that only shows longer life spans could have taken place, but does not show any limiting mechanism that would take place around the time of the Flood (when the Bible records the beginning of the lifespan shortening) to today. For this they appeal to a supernova event (high radiation exposure) that took place within a close enough proximity to earth and recently enough to be a plausible candidate for the long lifespans prior to the event and the shorter ones afterward. Beyond merely the origin of modern humans, the model proposed by Drs. Ross and Rana make predictions of what would be discovered about the origin of the different people groups around the globe. Since the model is based on the Biblical record, it predicts that all humanity originated in a single place then migrated around the world with relative rapidity. There are two competing models from the naturalistic perspective. The first is the multiregional view that posits that the different people groups evolved from different hominid lines. These hominids were already in the area, so the people groups are indigenous to the geography. The other competitive model is the "Out of Africa" model (described above). This one is similar to the Reasons to Believe model, in that it posits a common beginning location followed by a migration. In examining the genetic and fossil evidence for the peoples of Africa, Europe, Asia, Australia, and the Americas, the multiregional model does not have much support. The majority of evidence indicates genetic relation among the different groups and a migration pattern that began in east Africa. The relationship among the groups indicate the groups have a common ancestor with each other; this removes the idea of independent lineages (the multiregional view) from the table of plausibility. This leaves the RTB model and the "out of Africa" model intact. The "out of Africa" model, though, does not propose a mechanism to initiate the migration that fits comfortably with the naturalistic, evolutionary view of its proponents. On the other hand, the RTB model (based on the Bible) posits that God provided the mechanism. Geological evidence also places time constraints on the migrations to the various continents. This means that migrations had to take place rather quickly and (in the case of Australia) would require advanced cognitive abilities (described in previous chapters) to complete the migration. The Reasons to Believe model again outshines its competition. Chapter 9: Is Human Evolution A Fact? It is common for scientists to say that human evolution has been established as a fact. However, in order for this to be accurate, the fossil record and the genetic evidence must demonstrate that there is a gradual pattern of change from the earliest hominids to modern humans and that a clear pathway exists. Drs. Ross and Rana examine the different fossil finds of the various hominids. They discuss the disagreement regarding their dating, their location on the evolutionary tree, and even the categorization of the various finds as new species or existing ones. They grant that the fact that anthropologists do not know the exact number of hominid species does make classification and position on the tree difficult; however, they contend that there should be better agreement if evolutionists are to maintain that evolution is a fact established by the evidence. Ross and Rana explain that contrary to the issues that the evidence presents to the evolutionary paradigm, the creation model that they propose can readily accommodate the evidence. Since their model posits that both hominids and humans are special creations of God (with no relation to each other), the evidence of hominids (whether numerous species or just a few) fit comfortably no matter what their date. Several features set humans apart from the hominids. Two of these features are considered more significant in the distinction than the others: the ability to walk upright (bipedalism) and the larger brain-size-to-body-mass ratio. Drs. Ross and Rana describe each of these and the many physiological changes required for these features. The model offered by Ross and Rana predicts that both of these features would appear in the fossil record suddenly, not gradually, as the evolutionary model does. They explain nine changes that are required for bipedalism and show how drastic the changes between hominids and humans are. They note that in the history of the "development" of these features, they appear and remain static. They also present the studies showing the significant differences in brain sizes between the hominids and humans. Ross and Rana examine a few different evolutionary explanations that would trigger the changes and the evolutionary mechanism to accomplish the changes in the time the fossil record shows they would have taken place. The trigger and the mechanism simply do not work. On the other hand, the creation model predicts that these features would make an abrupt appearance, independent of time relative to the other species. The explanation and predictions provided by the RTB model have prevailed over the evolutionary explanation and predictions. Chapter 11: Who Was Turkana Boy? Some paleoanthropologists believe that Turkana Boy may be an early ancestor to humans. Classifying this fossil find has not been easy or unanimous. Some evidence points to a homo erectus classification, while other evidence indicates homo ergaster. The two species are very close to each other and have, themselves, been the subject of much controversy. Even with this controversy in place, Dr. Ross and Rana explain the implications of either classification. They examine several studies for both homo species that show that both of them are more ape-like than human-like. In fact, the evidence has even caused homo erectus to be relegated to being a side-branch on the evolutionary tree; they are no longer considered in the lineage of humanity, from an evolutionary perspective. Studies regarding brain size, tooth enamel, tool use, and fire use have all only widen the gap between humans and these hominids. Chapter 12: Who Were The Neanderthals? Some evolutionary paleoanthropologists have considered Neanderthals as being the line of modern humans. They point to anatomical similarities and overlapping dates to support this hypothesis. However, as studies continue, there seems to be a widening gap between the genetics of Neanderthals and humans. Genetic studies have also confirmed that the genes that would have changed between the two actually remained unchanged throughout the history of the two species. Studies into the brain differences have also yielded incredible differences that are not so easy to bridge step-by-step. It appears that the neanderthals and modern humans are distinct species with no ancestral relationship. The creation model proposed by Drs. Ross and Rana predict that despite some similarities between the species' genes and physical traits, there will be greater distinctions there and in behaviors, and that is exactly what the anthropological community, at large, has concluded. Chapter 13: What About Chimpanzees? Scientists have discovered that chimps and humans share a nearly 99% similarity in their DNA. Drs. Ross and Rana explain several studies that have led to this conclusion. However, they also show that such a discovery does not solidify the biological relationship of humans to chimps as strongly as evolutionists claim that it does. They begin by noting that the DNA compared to get the 99% similarity is not all the DNA. The regions compared in these studies was already suspected to have a high level of similarity, so it was the most interesting to the scientists and received the focus. When the other regions of the DNA of humans and chimps are compared, the amount of similarity goes down dramatically, as low as 86% in some regions. The significance of the difference is not found in the number, though. While humans and daffodils share only the most minuscule of physical similarity (and no biological relationship, from an evolutionary perspective), we still share 35% of our DNA with them. This level of physical difference and DNA similarity coexist because even the smallest difference in the DNA results in dramatic changes physically. So while it may seem like a good idea to use similarity in DNA to establish evolutionary relationships, it really is not. Chimps and humans do share a significant amount of DNA, but that does not accurately reflect biological relationships. Drs. Ross and Rana conclude the chapter by explaining that the model of origins that they propose predicts similarity among organisms. Because the Bible claims that all life was designed, the repeated use of viable designs is to be expected, and because the Bible claims that all life has a common Designer, a common "signature" in life is also expected to be present. While recent biochemical discoveries have created more challenges for the naturalistic, evolutionary paradigm to side-step, they have confirmed two dramatic predictions of the biblical model for human origins. Chapter 14: What About "Junk" DNA? In the areas of the DNA of organisms that is similar, much of it appears to not have any function for the organism. Evolutionists argue that if organisms were designed, then these would all possess function; the presence of the same non-functional chromosomes in multiple organisms confirm that they did share a common ancestor. Drs. Ross and Rana examine several areas of study that have confirmed the very opposite. Pseudogenes, short interspersed nuclear elements, long interspersed nuclear elements, and endogenous retroviruses have been often cited as examples of DNA segments that possess no function. However, recent studies have confirmed non-coding function for each of these. The results of the studies described by Drs. Ross and Rana have been so compelling to many researchers that they now expect to eventually discover function for all the other areas of DNA that were once thought to be mere "junk." This poses an incredible problem for the idea of common ancestry among organisms. The evolutionary paradigm predicts that much of the DNA in species today will be "junk" left over from mutated genes that lost their function over the generations. However, with every discovery of function for these genes, that prediction comes closer to complete failure. The fact that many biochemists expect that all the "junk" DNA will eventually be discovered to have function means that they also expect this prediction of the evolutionary idea of common ancestry to ultimately fail. On the other hand, the model proposed by Drs. Ross and Rana posits that the Designer was purposeful in His creation of organisms, thus the prediction of function for "junk" DNA flows naturally from the model. As research continues, this prediction comes closer to full confirmation, with little confirmations demonstrated with every gene that is discovered to have function. In the concluding chapter of Part 2 (the end of the first edition of the book) Drs. Ross and Rana summarize the previous chapters. They explain that the evidence provided is better explained by the biblical human origins model they offer, as opposed to the evolutionary view. They posit that science has made the idea of the historical Adam and Eve more plausible than ever and invite the reader to watch the coming research to continue to test their model. Chapter 16: Why this Update? Parts 1 and 2 contained the original content of the first edition of Who Was Adam. Drs. Ross and Rana explain that the purpose for this was to have the originally presented model easily accessible for testing against the discoveries of the ten years since its original publication. Part 3 takes the content of the original model and submits it to testing. They remind the reader that successful models make predictions that are confirmed by further discoveries. They also explain that a good model, if not perfectly accurate in its predictions, can be molded to accommodate the latest research without breaking other necessary features of the model. This part of the book should be read as testing the content in the previous parts and nuancing the model where necessary. The first set of discoveries provide more precise dates for the appearance of the first humans. Drs. Ross and Rana concede that the latest research does force them to revise the dates that they originally predicted for humanity's origin. Also, the latest research indicates that Adam and Eve were contemporaries of one another. A key feature of the model proposed by Ross and Rana has since had to be removed: the idea that the genetic evidence provided a direct confirmation of the bottleneck of the male lineage at the Flood. However, even though these two features of their model have had to be revised and removed, respectively, the model has received even more confirmation of accuracy in the more general prediction of the human species originating in or near Africa. A recent study in the field of linguistics has provided this confirmation. The latest research over the past decade has confirmed parts of the model and has forced the change of others. The model, though, is malleable enough to accommodate the latest research in the failed areas and is bolstered where it was found accurate. The model has new predictions where necessary and maintains predictions where research has confirmed it. Chapter 18: When Did Modern Human Behavior Begin? With the updated dates for humanity's origin, an interesting gap arises in the model between those new dates and the dates of human behavior. Fortunately, along with genetic discoveries over the last ten years pushing back the dates of humanity's origin, archeological discoveries have pushed back the dates on artistic expression and symbolic thought (seen as unique to modern humans in the model, because they alone possess the Image of God). The earlier dates found in both genetic and archeological data also allow for the model room to interpret the controversial find of "near-anatomically modern" hominids as actually modern humans (previously with the later dates, the model required that these be hominids that were not modern humans). The archeological data closes the gap initially created in the model by the new dates discussed in the previous chapter. Several new fossil finds and a reevaluation of an existing one over the last decade have allowed for more testing of the model offered by Dr's. Ross and Rana. These finds have caused major changes in the evolutionary paradigm. Some have shown that bipedalism originated abruptly not gradually and in a forest rather than an open savanna. These two alone challenge evolutionary explanations because emergence of features are predicted to be gradual not abrupt and the open savanna hypothesis provided a driving mechanism for the gradual emergence of bipedalism. Both the idea of gradual emergence and a mechanism to drive it are not supported by the evidence. An abrupt appearance makes more sense in a creation model. Other finds have also shown that the proposed common ancestors of humans and chimps actually coexisted so they could not have been in the line of succession. Further, these same finds demonstrate that these evolutionary ancestors were more ape-like in behavior than in the middle of human-like and ape-like. This also challenges their status as transitional forms. All of the discussed finds in this chapter demonstrate the confusion within the evolutionary community that continues. A successful model does not continue to produce confusion but to reduce it. The evolutionary model has done the exact opposite of a successful model. Chapter 20: Are Neanderthals Similar to Humans? The model proposed by Drs. Ross and Rana predicted that there would be some similarity between Neanderthals and humans, but the differences would rule out any ancestral link. Over the past decade, many genetic studies and cranial studies have confirmed this prediction. Genetic studies have shown that the DNA differences fall outside the range of human DNA variability. Cranial studies have shown that Neanderthals had a lower brain-to-body mass ratio and that a large portion of the brain mass was devoted to vision (with less available for other cognitive and social functions) These continue to move Neanderthals further away from being in the evolutionary line of humans. Genetic studies have also led researchers to conclude that there exists yet another species of hominid that was once thought to be Neanderthal (called the Denisovans). This new revelation has led to even more confusion when looking at the evidence from an evolutionary perspective. On the other hand, if one holds that these hominids were created uniquely from one another and humans, the similarities, the differences, and the "surprises" all make perfect sense. Ross' and Rana's model has faired well with testing these predictions. Over the course of the last ten years, more evidence speaking to the issue of human-hominid interbreeding has come to light. Several studies with Neanderthal DNA compared to various people groups indicate that there has been a small percentage of modern human DNA that was contributed by Neanderthals, some people groups more than others. While the genetic evidence seems to be growing, there does still seem to be some inconsistencies with other studies that, when resolved, may show interbreeding to be only one of multiple explanations for the genetic data. Drs. Ross and Rana are prepared to accept interbreeding if the evidence continues to exclusively support it (which would require that they address several theological and philosophical issues that are outside the realm of this book), but they also hold that it is still possible that interbreeding may not the only option for interpretation. Chapter 22: Did Neanderthals Have Smarts? The past ten years has yielded much more data regarding the intellectual level of Neanderthals. In this chapter Ross and Rana discuss several past discoveries and the latest updates to their original interpretation. Many evolutionists have taken several discoveries to be evidence for Neanderthals' advanced cognitive abilities. These have included grave sites, art, cooking, and language. Every one of the studies reexamined in this chapter has received further attention over the past decade. Each one, however, has had the original interpretation overturned by the new data. Archeological evidence no longer supports the idea that Neanderthals ritualistically buried their dead, created art, intentionally cooked their food, nor had the ability for language. Ross and Rana also included further studies about division of labor, which never supported Neanderthals' having cognitive abilities like humans, but does move these abilities further from those of humans. The model, offered by Ross and Rana regarding the uniqueness among Neanderthals and humans, enjoys a great deal of confirmation by these studies. The past ten years has yielded research that demonstrates the capacities of chimps. Studies have shown that chimps seek shelter, make beds, use tools to hunt, and mourn their dead. All of these findings reveal how endowed chimps really are. These behaviors, though, are more similar to those of the hominids than to humans. While the behaviors do reflect rudimentary human behaviors, the human behaviors are advanced in much more than mere degree. When comparing the behaviors to those of the hominids, though, the differences do seem to be only in degree. This indicates powerfully that there is no relationship between humans and chimps. Even though similarity in behaviors does seem to evidence common ancestry, the model that Ross and Rana propose states that there would be common emotional and cognitive behaviors due to their being created by a common designer (God) and the fact that they were created by God to be able to relate to humans. Such findings do not threaten their model in any way but rather supports it. Since the publication of the first edition of "Who Was Adam," the gorilla and bonobo genomes have been sequenced and a surpise was uncovered: the gorilla genome more closely matched with the human genome than did the chimp genome. What is significant here is that common ancestry (evolutionary) models predict that chimp DNA would be more like humans because they diverged from humans more recently. This represents a failed prediction of common ancestry models. On the other hand, since Ross' and Rana's model holds no common ancestry among the species but does hold to a common designer, the common DNA (regardless of which is closer than another) represents a confirmed prediction. Further, this also demonstrates (as was predicted in the first edition) that gene similarity tells very little of the story of commonalities; rather it is how those common genes are expressed that should be taken into account before concluding that one species is more closely "related" to another. Chapter 25: Is It Time to Scrap Junk DNA? Ten years ago, Drs. Ross and Rana predicted that genes that seemed to not have any function would eventually be discovered to have functions. Since then this prediction has been found to be accurate. With the research of the ENCODE project and discoveries regarding pseudogenes, ALU sequences, and gene expression, the idea that junk DNA actually exists is losing acceptance. As more studies are conducted and a greater understanding of biochemical systems is obtained, more of what scientists thought had no function are being found to serve necessary roles. This prediction of the model has withstood the test of a decade of time and continues to be proven correct to this day. Critics of RTB's model have offered much feedback since the initial publication of "Who Was Adam." Drs. Ross and Rana address several critiques that, if valid, would have the greatest impact on the model. These include the original human population size (a single pair or a few thousand), new evidence supports a modified version of multi-regionalism, misrepresentation of hominid brain sizes, and agriculture's origination well after the appearance of modern humans. Over the past decade, there is arisen a need to augment human origins models. Ross and Rana present in this chapter three new explanatory features of their model: human races, human disease, and genomics. In this chapter, they explain the features of the new version of their model. Their model predicts that scientists will discover that the races originated rapidly, that bacteria and viruses that cause human ailments will be found to be beneficial in other ways (or in a relatively few cases be found to be mutations of originally functional bacteria or viruses), and that genomically similar and dissimilar features among organisms will be found to be functional respective to similar and dissimilar functions of the organisms in their ecosystem. Chapter 28: Where Does The RTB Model Stand? In this final chapter, Ross and Rana present a list of the features of their original model that have been affirmed and challenged by discoveries over the last decade. They also provide a quick summary of how they have altered the model to accommodate the latter. They believe that the fact that many predictions have been confirmed shows the overall truth of their model, while the ability to accommodate unexpected discoveries demonstrates its flexibility. They believe the model has fared well over the last decade, but they expect it to continue to face challenges that will require changes (especially since they have added the three new features described in the last chapter). They believe that the discoveries of the last decade have shown that Adam, as described in the Bible, was the original human being created in the Image of God, and the expect that science discoveries will continue to demonstrate the validity of the scriptural record and point people toward Christ. This book was quite the read. I really liked the fact that Ross and Rana chose to maintain the original work before evaluating the model. Even though I read the first edition when it was released, there was much of the model that I had forgotten, and for the first-timer, knowing the model being evaluated and updated, as originally presented, is essential. This allows the reader to truly see that the authors are honestly submitting their model to testing. However, this type of presentation did prove a bit frustrating at times. Since the first two parts were ten years old, some of the material was out-dated (and overturned, in some cases). Some of these I knew as I was reading while others I found out in reading the third part. If you will be reading these authors for the first time or haven't read the first edition, please keep this in mind and understand that it will be addressed in the third part. I always have high recommendations for the authors' works, and this one is no exception. However, my recommendation does come with a small warning. If you are nominally interested in the origin of humanity, "Who Was Adam" could frustrate you quickly with its depth and detail, or it will draw you into a world of science and faith that you have only dreamed exists like it did for me nearly ten years ago. Now, if you are extremely interested in the origin of humanity (especially its relation to the record presented in Genesis), you definitely need to get a copy of this book. It will alert you to a model that scientifically challenges current naturalistic models and provides an alternative to Christian models that have little-to-no scientific merit. It is a great book, and if after reading this full review you are still interested, you will not be disappointed.